Compare the two photos of the mouth, top one taken on March 20, 2018 and bottom one taken about two months earlier. 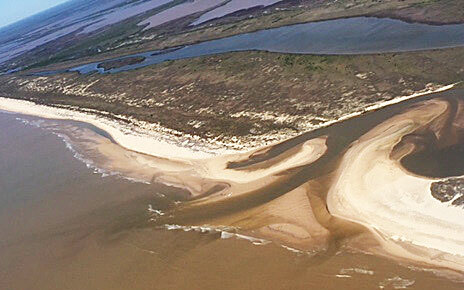 The two curved sandbars are rapidly closing the mouth. County Commissioner Dude Payne stood up at the March 6th USACE meeting to tell the Corps the mouth re-opening is going to happen and soon. "We're going to get it open..."
County Commissioner David Linder told the Corps at the meeting, he found their lack of communication with local leaders to be offensive. Read “Write" the Wrong Planned for River by USACE below and get a plan of action on what you can do!